If you’re thinking of remodeling your kitchen, you might want to consider looking back to the styles of yesteryear. Many kitchens from in the 1930s were not only stylish, but also practical, keeping in mind that this was the time of the great depression. Distinct electrical appliances that were built to last were popular in the 1930s along with checkerboard floor patterns made of linoleum for easy cleaning, and bolder wall colors such as bright yellows, jade or lime greens and bright blues. There were lots of wallpaper patterns used in that era with designs of flowers, food, and even appliances. Appliances in the 1930s were pretty basic. Refrigerators were present if the family could afford them, and the stove was usually the centerpiece of the room. Appliances didn’t come in a wide variety of colors in the early 30s (usually black, white or gray), but the later models offered more variation. 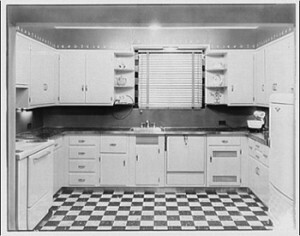 Most cabinets in the 1930s were built-in and installed both below and above kitchen counters. Simple in design, they were often boxy and flush with countertops. They had very sparse detailed decorations or woodwork with glass or metal rectangular knobs and handles. Some even had no doors at all. In vintage-schemed kitchens, countertops with a soft finish in color are a great compliment of the past. Your designer can help you choose between a variety of materials, including soapstone, marble, laminate and linoleum (depending on your budget). Marbleized designs or bright color motifs were popular during this time period. There are many ways to incorporate 1930s style into your home today. Keep in mind bold colors and accessories, and add in some antique pieces along with ‘30s themed modern energy efficient appliances. If you have a 1930’s themed kitchen, feel free to share tips and links to pictures in the comments section below. We’d love to see!